Every two years, the media literacy community gathers for its bi-annual conference, and this July 12 – 13, we met in Los Angeles. I was honored to work with NAMLE Conference Program Chair Erin Reilly of ASC’s Annenberg Innovation Lab on a session entitled, “Words Matter Provocation.” We wanted to poke and prod our way through the convergence — or discontinuity — that’s occurring now as more and more stakeholders gain interest in advancing core competencies that enable people to be effective in accessing, analyzing, evaluating, communicating, reflecting and taking action in the world. We designed an interactive learning experience with a ballroom full of conference attendees and worked through two activities in just one hour. Such fun! I’ll admit that this year’s NAMLE had a unique range of voices and some perspectives were notably absent. (I can claim some responsibility for perpetuating the conflict between the “media education” and “media effects” stakeholders.) There was also some robust discussion by Jeff Share and others at the NAMLE conference about the characteristics of the “big tent” drawing itself. Their major concern: Why does it depict critical media literacy under the Protectionism domain? This could the topic of a fine dissertation, I suspect. The Words that Matter Most to NAMLE Members. In the second activity, participants reviewed a list of 30 words and personally selected the 7 that most reflect their work. Language is simultaneously a uniting and dividing force in the world. At the event, we humbly acknowledged that words are in a continual state of flux and only mean what we agree that they mean. To deepen our exploration, we generated a collection of “omitted words” and “problematic words.” When Erin and I asked people to discuss the most important words at their tables, discussions were energetic. Later this fall, we will share more reflections on lessons learned from these activities, I hope. Why do I love NAMLE? Though dialogue with diverse others who share a passion for media literacy education, I gain a better understanding of the nuance of meanings associated with the words I use. The special words of media literacy help us establish distinctiveness in relation to related discourse communities, including ed tech, media studies, school reform, literacy education, and other fields. The goal of this session was intended to deepen awareness and promote listening. There is a certain power embedded in words (and the questions we ask about their meanings). How can we learn to listen well across the intersections of disciplines that represent the complex intellectual heritage of our community? As you can imagine, the experience of this session generated many intriguing questions for me. 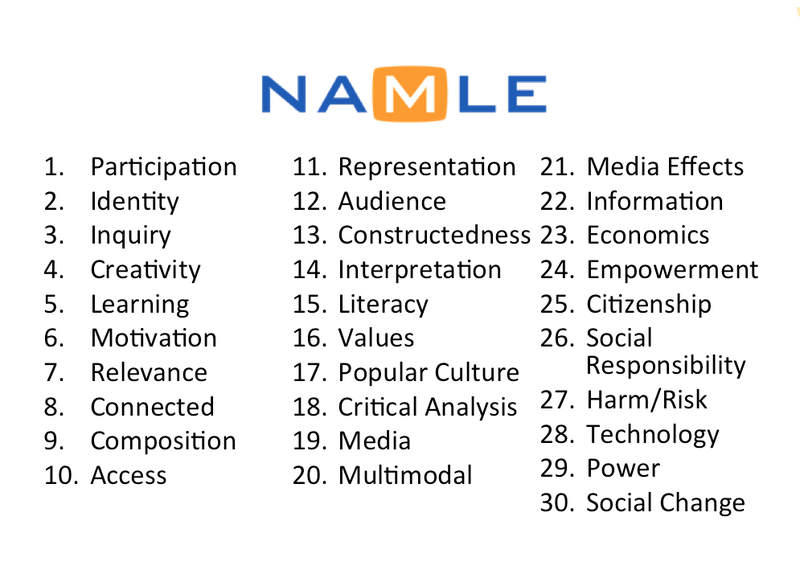 I left NAMLE 2013 wondering: Does the diversity of media literacy stakeholders represent a strength or a weakness to the future of the movement and/or the field? Let me know your thoughts on this topic, please. It is great visualization of the complex ML field. 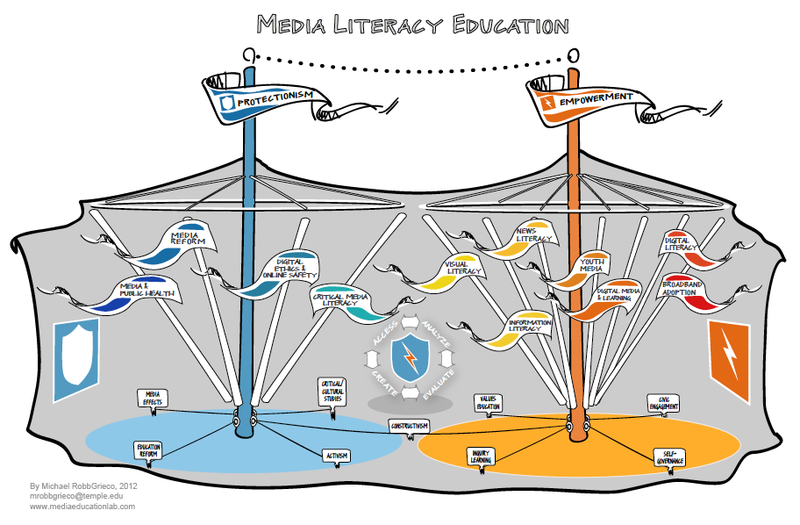 Media Literacy’s Big Tent is very plain, understandable and inspiring. I like it very much. I can translate to Turkish (if other languages have an attraction), if you send graphic without text. Renee, this was an incredibly valuable (and media literate) session at NAMLE this year. Kudos to you and Erin. I’d like to see “health literacy” included in the tent as I am finding an increasing disconnect between public education and what young people actually need to be “healthy”—physically, mentally and socially. It’s more complicated than the traditional health and physical education curriculum and I believe media literacy has the educational breadth and depth to take us where we need to be as a society. Ironically, media literacy is not required curriculum in most U.S. schools; neither is it a requirement in teacher preparation programs. That has to change. Certainly navigating the language (including that of Common Core) will help. A bigger concern of mine, however, is that while the “big tent” is inclusive and semantically nuanced, there needs to be something explicit that UNIFIES the media literacy movement in order to catalyze significant and widespread social, political and economic change—to take media literacy to the next level. I don’t yet know what that unifying principle (or word) is, yet. Thoughts, anyone? I hope 3 of the unifying concepts are: popular culture, constructedness and inquiry. Renee, this is such an important conversation to have–identifying common ground across these different perspectives of media literacy and, perhaps even more importantly, acknowledging some of the distinctions between them. (This might be a little long–though hopefully not as long as a dissertation). I would guess that Robb Grieco positioned Critical Media Literacy under the Protectionism tent because some assume that since CML has explicitly political agendas, its goal is to teach students particular ideologies and ‘protect’ them from others. And because CML’s political perspective often draws upon Marxism, some assume that its just another ‘mass culture’ argument. Yes, both CML and some protectionist approaches draw upon Marx and other thinkers concerned about the effects of modernization (including mass communication) on society. But the important distinction is that while advocates of protectionism (like Leavis or Postman or a lot of the media effects folks) see new media technologies and practices as harmful and people as vulnerable to this harm, a CML perspective (drawing upon Dewey, Freire, critical and feminist theories) understands the relationship between media and society as dialectical and position people as agents of change. And in order for students to become effective agents of change, they can’t just be brainwashed with particular ideologies (progressive or not). CML acknowledges this, and draws heavily from traditions of critical pedagogy and radical democracy to create educational approaches and environments that facilitate students’ critical, creative thought and civic engagement. So, I don’t know that we need a dissertation to explain to us why Robb Grieco put CML where he did in that picture. He put it there because of a misunderstanding that many within the field have of the objectives and strategies of CML. But ask Jeff Share, Paul Mihailidis, Steve Goodman or any number of people who identify with CML, and they’ll tell you that Empowerment–Not Protection–is its primary goal.